All Star Driving School offers MTO approved beginner driver education courses. All Star driving school provides both the mandatory 20 hours held within the classroom and 10 hours of in car lessons, completion of both the in class and in car lessons allows All Star to provide our students with an MTO approved insurance deductible that is redeemable at any Service Ontario. Our in class location is a bright and always kept clean. Our in class room vibe is always fun and upbeat yet remaining educational and properly preparing our students to be the best and safest drivers they can be. Our courses are available all year round; we offer weekend classes, evening classes through the fall and winter, 4 day holiday classes as well as week day courses through the summer holidays. If you are unable to attend a session you can always make it up at any point during a period of one year. Our in class sessions work around the busy schedule of our students, at All Star Driving School we make our students are number one priority. All Star Driving School uses both clean and safe cars. Our instructors are very friendly and patient; our instructor’s schedules are flexible and very accommodating to the schedule of our students. All in car appointments are held one on one between the student and instructor. All of our All Star instructors are MTO qualified and approved by York Region. 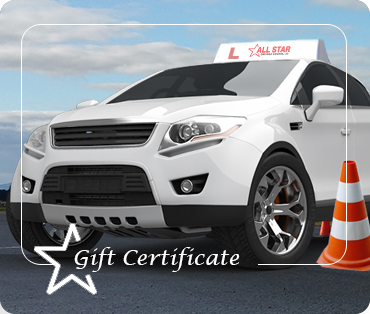 At All Star we allow our students to take both there in car and in class lessons at the same time to allow students for a faster completion of the driving school program. At All Star we do not have hidden costs, we are up front and fair with our prices.